SLAC loving revives a contemporary classic, giving an absurd story of three down-on-their-luck men a wordy, well-paced turn. 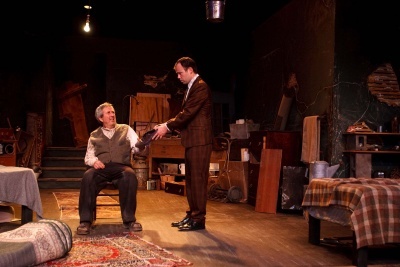 When you watch Salt Lake Acting Company's "The Caretaker," it helps to know that playwright Harold Pinter is considered part of "theater of the absurd" school -- a reaction to the existential absurdity of post World War II society. If you walk out of the theater feeling a little anxious, as if the story that just unfolded remains incomplete, you've been what one might call "Pinterized." For that to work, solid and precise direction of the performances is key. In this case, director John Vreeke knows exactly the intention --- or lack of intention -- of Pinter's script. 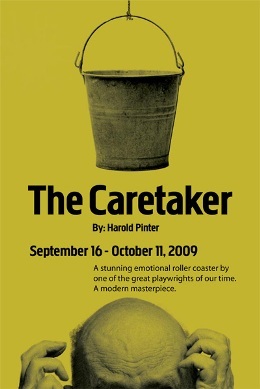 "The Caretaker" is an unusual choice for the Salt Lake company dedicated to producing contemporary works, as Pinter's play might be considered more of a "contemporary classic," after becoming the playwright's first significant commercial success when it opened in 1960 at London's Arts Theatre Club. Nearly 50 years later, Pinter's language needs the right punctuation, inflection and intonation to make it effectively land in the ears of theatergoers. Vreeke lives up to the challenge of the wordy script by helping his three-man cast achieve a consistent pace. Of course, he's aided by three very different, very smart actors who listen and understand both the script and their characters, working together to create Pinter-level anxiety. Take the character of Davies (Joe Cronin), for example, an old man who talks nonstop, for such extensive stretches that you can't help but be impressed at Cronin's memorization skills and want to stick around to figure out what the character is jabbering about. With less confident direction, Davies' speeches might either drive an impatient audience mad -- or to sleep. 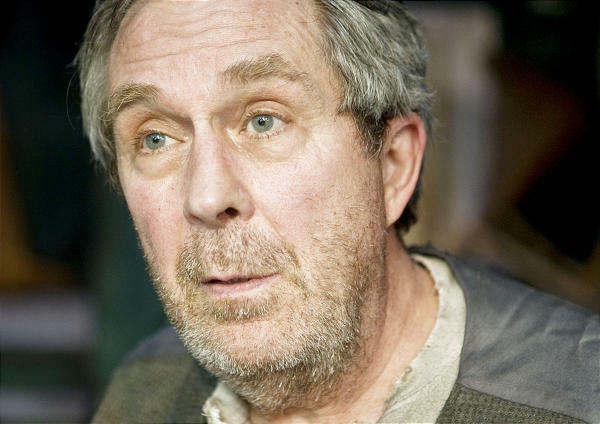 Cronin's physical twitches, both subtle and overt, help the actor embody a weathered man, down on his luck, who is on the verge on dementia or just plain exhaustion. You learn he's been fired and nearly caught up in a bar fight, before he's invited to share the night by Aston (Daniel Beecher), whose act of generosity seems more complicated than the characters let on. "What's your game?" challenges Mick (Matthew Ivan Bennett) Davies, with a judgemental, and mischievous yet dangerous grin. Bennett, known locally as the quiet resident playwright of the Plan-B Theatre Company, can act, too. His onstage confidence and stealthy movements make his character's quicksilver transitions believable as he turns from bully to vulnerable, frustrated dreamer. Davies repeatedly talks about going down to Sidcup to find the man who has his papers. Aston, a mostly passive, aloof character, reveals much of the play's absurd humor in the way he doesn't respond to the old man's accelerating demands. He thinks his house and life will be repaired when he builds a shed in the garden. Mick ricochets between challenging the stranger and inventing his own perfectly decorated household. In act two, Aston reveals his vulnerability with a detailed account of his time in a mental hospital. Beecher gives the speech a nuance that underscores both the effect and significance of the experience. 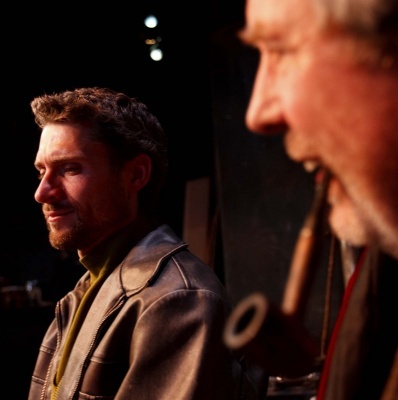 He begins his story by talking with Davies, but thanks to Jim Craig's skillful, subtle lighting design, his revelations build to become an intimate soul bearing conversation with the audience. And Beecher gets the demanding story's pace and tone just right. What makes the performances so effective is how each of the three characters work individually, as if they are on their own mental islands, and have just happened to cross paths with the others. They remain true to themselves, each of their stories not quite adding up, each character humorous at times, and also isolated, erratic, frustrated and fearful. Finally, Keven Myhre's set is impressive both in its scale and detail. Expanding the stage gives the actors the liberty to move about physically -- and metaphorically -- while delivering their long speeches. The dimension offers the audience depth and contrast in a world that seems constricted by each character's limitations, making the story add up to something bigger than its parts. So do you want a brief theatre history lesson? Although your answer is probably a resounding “No!”, just humor me for the slightest moment as it will help you understand the vast importance of why you should see Salt Lake Acting Company’s (SLAC) The Caretaker by Harold Pinter. Don’t worry, I will spare you nonsense about Greeks and Shakespeare. In the more recent past, about 50 years ago, there was a theatre movement deemed by Martin Esslin as “Theatre of the Absurd.” It was a reaction to World War II highlighting the philosophy that all attempts to find meaning in this life are “absurd” because there is no meaning to life. Depressed yet? Just wait… To more clearly paint the right picture, think existential, think post-apocalyptic, think Nietzsche. Now put it on stage with kooky characters, surreal situations, and far reaching symbolism and behold the Theatre of the Absurd. Such modern classics as Waiting For Godot, The Bald Soprano, and The Zoo Story all emerged during this time with beautifully constructed plays heavy on dialogue and thought provoking themes; low on action and meaningless melodrama; revolutionary in thought and storytelling. This movement continued into the 21st century and is still influencing playwrights of our day like David Mamet, Sam Shepherd, Tom Stoppard, and, until his death in December of last year, Harold Pinter. And this is where the past meets the present as SLAC. In conjunction with their 2009-2010 season, currently playing, Pinter’s fantastically depressing, yet poignantly humane play, The Caretaker. It has all the issues of 50 years ago and themes that seem to be just as pertinent today. SLAC has truly lived up to everything absurd and more under the direction of John Vreeke and his cast of Daniel Beecher, Joe Cronin, and Matthew Ivan Bennett. Vreeke’s command of the crowded space is also worth commending. The mountains of stuff and the piles of junk never felt awkward or encumbering. Interestingly, the same thing could be said for the very dialogue of the script. Instead of allowing the mountains of words and piles of pauses to take over the story, each actor was able to use his words to propel his character forward. As an audience member, I was never left behind in a heap of confusing language. You have to see the set! I’m not kidding. Walking into the theatre, the eye is drawn immediately to the stage. It’s like the old lady’s house down the street. You know, the one with all the cats; old hand-pump spray guns, out-dated toasters, bags, books, buddhas-honestly you name it, they have it. The dilapidation is artistic in design, and yet gritty in feel. The textures between the holes in the walls and the famous bucket made me want to reach out and touch everything. It all had such a rough yet subdued tone perfectly enhancing the world created by Pinter. The entire creative team came together and presented a very cohesive piece of art. This show was a prime example of collaboration success. Pinter himself said “As far as I am concerned The Caretaker is funny, up to a point. Beyond that point, it ceases to be funny, and it is because of that point that I wrote it.” SLAC brilliantly illustrated what Pinter had in mind. Ol’ Harold would be proud. 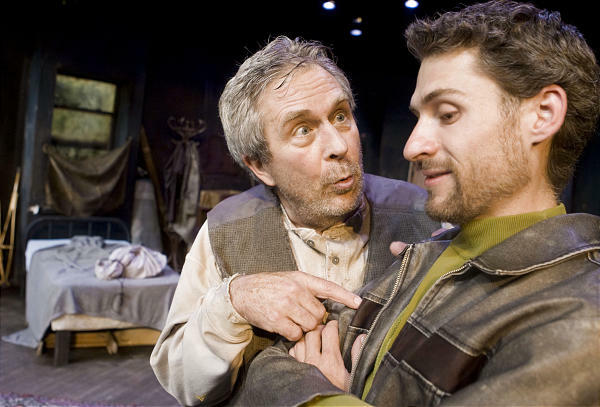 The Salt Lake Acting Company, perhaps best known for tackling contemporary theater, opens its 2009-10 season with a play that debuted a full 49 years ago. Harold Pinter's "The Caretaker" is a challenging opener. It's challenging for the audience, requiring patience as the three-character drama unfolds in languid scenes with few fits and starts. And it's challenging for the actors who had to memorize reams of Pinter's rapid-fire dialogue and deliver it in believable English accents. 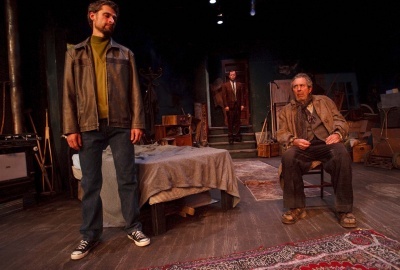 Thankfully, from the audience perspective, "The Caretaker" is well worth the effort of getting to know the three characters: brothers Mick (Matthew Ivan Bennett) and Aston (Daniel Beecher), and vagabond Davies (Joe Cronin), who Aston brings home at the beginning of the play, launching the slow unveiling of the three characters' true selves. At face value, not a lot happens in "The Caretaker." The action, such as it is, takes place in Aston's shoddy apartment (fine job by the set designers). Conversations of different combinations of the trio eventually let the audience inside their lives, but for much of the first and second act, we're left guessing not only WHO these characters are, but WHAT they're up to as well. 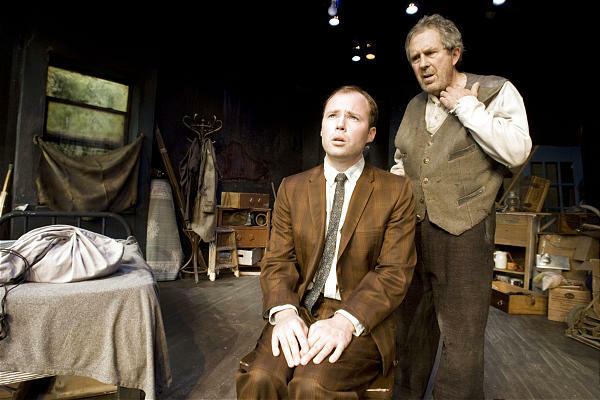 Pinter's gift for language goes a long way in keeping the audience engaged, as do the performances of all three actors. Each of them succeeds in creating a character that you want to know more about. Is Davies the harmless homeless man he seems to be, or someone more nefarious? Is Aston a somewhat dim-witted nice guy, or something more? And is Mick as dangerous as he sometimes seems, or more of a devoted brother than he appears? These questions slowly work themselves out over the course of three relatively short acts. As each character's true self is revealed, it is through subtle conversations rather than blockbuster secrets being revealed. There's plenty of humor along the way, as well as a real sense of danger in several scenes. While "The Caretaker" is anything but a light night at the theater, word wonks will revel in Pinter's poetry. And again, the performances of the three actors warrant recognition from any Utah theater lovers. "The Caretaker" runs at Salt Lake Acting Company thru Oct. 11. In a cluttered bedroom, a sad-looking man named Aston (Daniel Beecher) invites an old, homeless man named Davies (Joe Cronin) to stay with him until he can fix himself up. In conversations punctuated by unworldly string music and a leaky roof, Aston offers to pay Davies a bit to be caretaker of the place. But, we soon learn, Aston's younger brother Mick (Matthew Ivan Bennett) is the real owner of the house, which calls into question who Davies' employer actually is. If you are tone-deaf to interpersonal relations -- maybe you had some brain work done some years back? -- and can't see past the disingenuous fronts of people, then this is all you will see in Nobel Prize winner Harold Pinter's play "The Caretaker." I mean, really, that's it, the end. Then you'll shuffle away, head hung, to the next task of your day. If you are the kind of paranoid who sees clearly the sinister machinations behind every friend's intention, you'll instead experience dense prose dripping with subtext. You'll meet an unkempt, unwashed old gentleman who calls immigrants dirty and is stuck in the state of "can't get a decent break," no matter how many bones are thrown to him. You'll find that metaphor disturbingly apt, as he exhibits a painful readiness to be treated like a dog, ingratiating himself to whoever abuses him the most and biting the hand that feeds him. Then you'll walk away wondering whether everyone who offers you his hand is secretly striving to pilfer your sovereignty and status. There is a Sartrean, "Hell is other people" feel to "The Caretaker." Throw in the anxious complacency and absurdism of "Waiting for Godot." (While you're at it, note the explicit absence of mirrors and clocks.) Pinter's characters beg to be limited -- by each other, by the weather, by the world -- so that they can exculpate themselves of responsibility for their failures. The three have a common monomania that keeps them from getting past the next item on their to-do list. Each picks an obsession to busy himself, so as not to be scared of whatever role is next in life. The self-absorbed, litany-like repetition of their sapped aspirations sounds like a hypnotic refrain, interwoven through the script. All three characters could have been portrayed as caricatures; instead, their respective actors fill out their roles with energy and poignancy. Bennett, whom some will recognize as the resident playwright of Plan-B Theatre Company, is the least fitted to his role yet adds the most charismatic presence and ably counterbalances his two foils. To watch the onstage repartee is to watch power and respect superficially changing hands. Fear makes people nasty -- especially fear of the future. Doing someone a favor may lift us up in his eyes -- or mark us as inferior and deferent. Same with other cues: asking or proffering advice, waving a knife, forcing others to choose sides, condemning their combativeness once they do. It's tragic to watch people continually pop the balloons of their own ambitions. It's more so to watch them keep each other down by trying to maintain the upper hand. No one wins this game. The power play drifts off without a solid conclusion -- but with a stark, powerful impression. 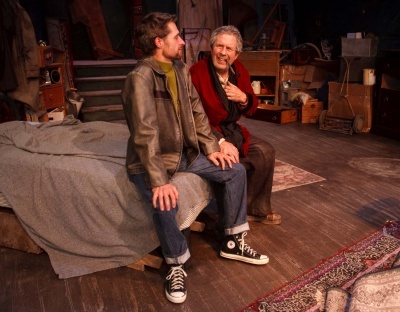 SLAC produces a regional premiere of "The Caretaker," Pinter's 50-year-old contemporary classic, with a character given to speechifying, like that other well-known talker. If legendary playwright Harold Pinter were alive, he might describe "The Caretaker" this way: "It's about a bum and two brothers." "That's what he would've said, so I'm not saying anymore,"
Salt Lake Acting Company's season opener is, of course, about more than the obvious featured trio. "It's musical," Vreeke said. "It's vague. It's mysterious. It's full of tension. It's full of psychology." The contemporary classic play, which first opened in 1960 at London's Arts Theatre, is being produced in memory of Pinter, who died in December 2008. "Pinter is an exacting genius [as a] writer," the director said. "I don't think there are many of those. He is like Shakespeare, where every single word is placed very carefully. Every punctuation and pause is very exact." After 50 years, the play's universal human theme still resonates. What theatergoers think of its themes -- "about how we take care of each other and how we don't take care of each other," as Vreeke summarized -- will depend on their experience. The play's "emotional roller coaster" of a plot involves a transient, Davies (Joe Cronin), and brothers Aston (Daniel Beecher) and Mick (Matthew Ivan Bennett), and what results when the three engage in complex power games in a dilapidated west London apartment. Local actor Gene Pack, 78, was originally cast to play Davies, but the part proved to be too demanding, and so Oregon-based actor Joe Cronin (who played Ken Carpenter in SLAC's 2005 production of "The Man From Nebraska") took over the role two weeks into rehearsals. 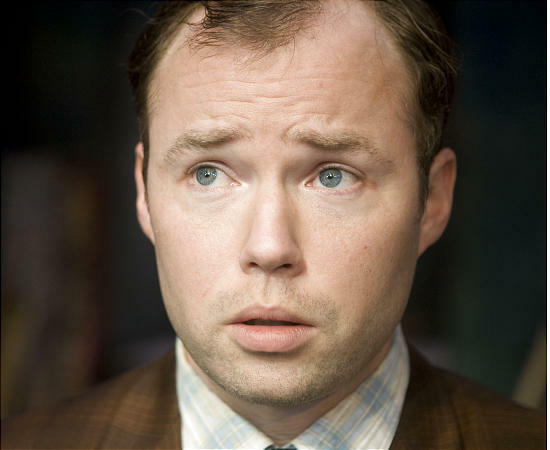 Vreeke compares the character to Hamlet, because of his tendency to give speeches. "He is a jabberer," the director said." He doesn't shut up." Looking the part with an unshaven beard and messy hair, Cronin said he hasn't worked as hard since he was part of a landscaping crew at a U.S. Air Force base chopping down trees. "It's been a lot of heavy lifting, learning lines, of course, because it's a huge role," he said. But reading the play, Cronin found relief in realizing the role was a combination of characters he knew. "I knew who he was and how he talked," Cronin said. As Aston, the brother, Daniel Beecher is playing his second role at SLAC, while its a first for Bennett, known as Plan-B Theatre Company's resident playwright. 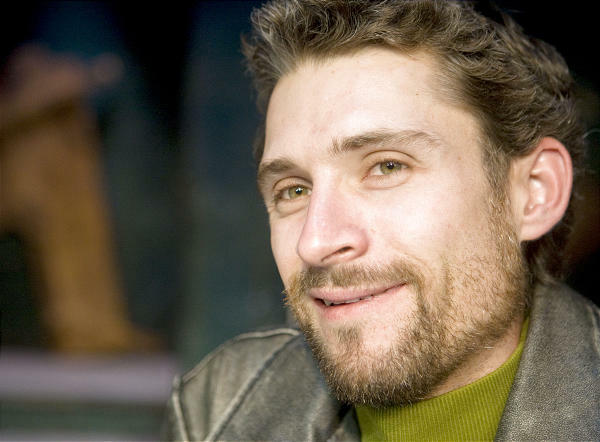 Bennett, a self-described introvert who has performed at the Utah Shakespearean Festival and on the company's education tours, said acting helps his writing because it revivifies the way he thinks about character. "We have three really smart actors who understand how to work," Vreeke said, "the challenges and beauty of Pinter's language, and are particular suited for their characters." Two brothers and a bum. That's not the start to a bad joke, rather it's the way the late playwright Harold Pinter described his work "The Caretaker." "It sounds flippant to describe it that way," said actor Joe Cronin, "but if you pick one theme you're ignoring the other." 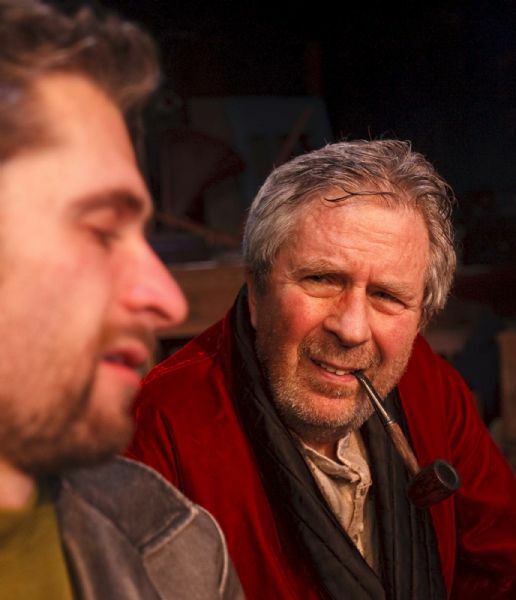 Cronin, who takes on the daunting role of the bum Davies, chatted by phone before a recent rehearsal. "I see lots of themes: time, mortality, relationships. … Everyone can come out with something different. There is something for everyone." But Pinter himself isn't for everyone. "He's not everybody's cup of tea," said director John Vreeke. "Pinter is a very brilliant poet and playwright, right down to punctuation. This is a poetic language play." Pinter is known for lengthy monologues and dramatic pauses. "You learn how to play the language, like you learn how to play a piece of music," Vreeke said. "The challenge is learning the score as written; all the pauses, periods and commas. Once that is learned, which is a formidable task, then you can really interpret the play." And that is an interesting undertaking. "Theater of the Absurd is a tricky genre," Vreeke said. "It was a group of writers who wrote in the '50s and '60s. They were atheists and had a pretty grim world-view. These writers take that kind of moral conundrum, 'What are we doing in this world,' and they place the stories and characters out there to make the audience ask those questions." But plays of this genre rarely provide answers. "There are certain mysteries in the play that are never really answered," Vreeke said. "I think any good writing, really, really good writing doesn't answer questions, but it asks lots of great questions." "There have been volumes written about this play," Vreeke said, "but Pinter never wanted to state what the play was really about, other than two brothers and a bum. After that it's for the audience to make a decision." "Although the characters look bizarre and think and speak in bizarre ways, they represent something everyone experiences," said actor Cronin, who has been to Utah numerous times, performing at both SLAC and the Utah Shakespearean Festival. "The caretaker has so much meaning for all of the various relationships in the play." With Pinter's death in December of 2008, this is also a memorial presentation. "Pinter is a classic modern writer," Cronin said. "He'll be remembered for a long time." "We're doing the play as Pinter wrote it," Vreeke said. "It's a 40-year-old play, so it's really not old enough to be reinvented, and there's not reason to. It's as pertinent in '09 as it was in '52 when he wrote it." "Not everybody likes Pinter," he said, "but our job is to do everything we can to create a compelling moment-to-moment experience. Which will, hopefully, keep the audience on the edge of its seat. Compelling human behavior is always what we enjoy watching."